The Tattvasangraha or 'Compendium of True Doctrines', as Dr. Jha translates the term, throws a flood of light on the Buddhist metaphysics, logic and epistemology. A remarkable feature of the work is that it reproduces the views of scholars who would otherwise have remained in perfect oblivion. The commentator Kamalasila gives the names of such authors and quotes from them. The work shows the philosophical activities and speculations of nearly three centuries from the time of Dharmakirti down to Uddyotakara. The Tattvasangraha studied along with Uddyotakara's Nyayavartika and Kumarila's Slokavartika gives a good picture of the cultural movements of the centuries. The Buddhist attack on the realism sponsored by Nyaya, particularly the refutation of the soul theories which had created a great commotion in the orthodox circles, and the Buddhist criticism of the infallibility of the Vedas which too had given a big jolt, provoked spirited counter-attacks from the orthodox thinkers and a vigorous defence of the faith which succeeded in undermining the prestige of the Buddhist Church. However, the Buddhist also reacted with vigour and the Tattvasangraha pre-eminently represents this phase of the Buddhist reaction. The work begins with a critique of the concept of Prakrti or Pradhana followed by an examination of the creatorship of God, Purusa, Atman and the permanence of things. It contains a detailed discussion of the traditional categories like Substance, Action, Ultimate individuality, Quality, Universal and Inherence. Then the traditional means of knowledge-are examined, followed by the treatment of Syadvada, Three points of time, and the Carvaka system. Finally the work deals with a critique of the validity of revelation, of the arguments for the existence of the external world, and of those for the self-validity of knowledge. Much need not be said here in regard to the personal history of the two authors-regarding their (a) date, (b) residence, (c) contact and relation with other writers; as all this has been dealt with in great detail in the excellent Foreword attached to Vol. I of the Sanskrit Text. From this we learn that our Authors-who were Master and Pupil-(a) lived between 705 and 764 A.D.,-(b) they were residents of Magadha in North India, from where they went over to Thibet. There are some points in connection with the third point (c). Among the other writers referred to in the work, we have the name' Sahantabhadra' occurring twice in the Text (pages 506 and 508); while the name given in the Foreword is 'Sanghabhara', and the pages referred to therein are also the same-506 and 508. Which of the two is the correct form of the name Sanghabhadra' would appear to be so,-because we know what, Sangha' is; while we do not know what' Sahanta' is. In the body of the Translation, however, we have retained the form 'Sahantabhadra', because it was felt that the same misprint, if it is a misprint, could not appear twice, and in such close proximity too. It is interesting to note that 'Samantabhadra' is one of the names of the Buddha Himself mentioned in the Amarakosa. 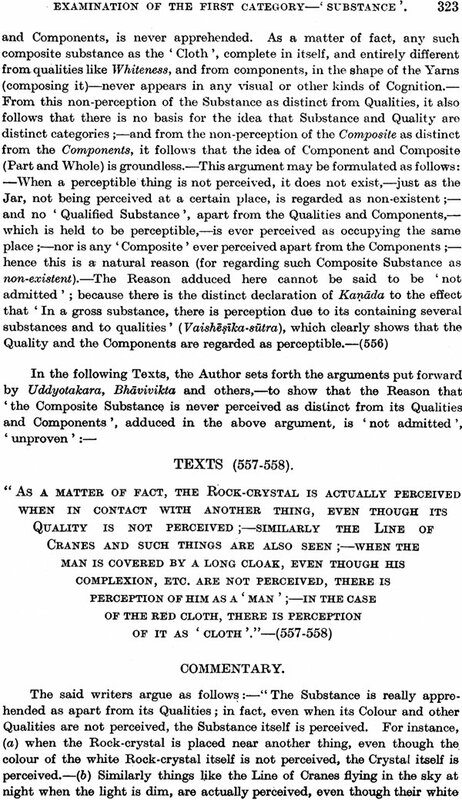 Another interesting point regarding this third point (c) is that while the authors deal with, name and make large quotations from, the works of Shabara and Kumarila, they do not seem even to know Prabhakara; and yet Prabhakara flourished about the same time as Kumarila, if not earlier; and his views are really deserving of notice. The reason for this perhaps lay in the fact that Prabhakara does not materially deviate from Shabara, while Kumrila does deviate from him, and in his attempt to revive the' Astika-patha', he renders himself open to direct attack from the other quarter. The list of authors provided in the Foreword does not contain the name of 'Vatsiputra', and yet the Author devotes Texts 336-349 to the demolishing of the Pudgala-philosophy of this writer, who is described as Apparently he represents a distinct sect among Buddhists known as ' Vatsiputriya ' Pudgala' appears to figure very largely in the presentation of this philosophy. The Foreword to the Text also provides us with an account of the 'philosophy' of our Authors (vide pp. XXXVIII-LIII); wherein we have a connected account of most of the important topics. For all this the reader is referred to the said volume. Here we are goiI1g'to put together what details we have gleaned from the Text, in course-of the translating. Though the above-mentioned Foreword has supplied us 'with an exhaustive list of Authors referred to and named in the Tattva-samgraha and its commentary, one fails to find there the name of Tayin who is named, and quoted from, in the Commentary on p. 12 of the Text and again in Shantaraksita's text itself in Verse 1788. One wonders if Tayin is a title of one of the writers already mentioned in the Foreword. From Text 3320, it would seem as if' Tayin' were only another name for Buddha Himself; as Tayin is here spoken of as 'Sarvavit', 'omniscient', .which epithet can apply to the Buddha only ;-this same identification is indicated also in Texts 3368, 3498, 3501 (which again speaks of Tayin as 'omniscient ') where the commentary definitely says-' Tayino buddhasya', "of Tayin the Buddha'. Under Text 1565, we have a simple explanation of the generally accepted principle that the Cognition apprehending what has been already apprehended by another Cognition, is not Pramaya-not a valid Cognition. 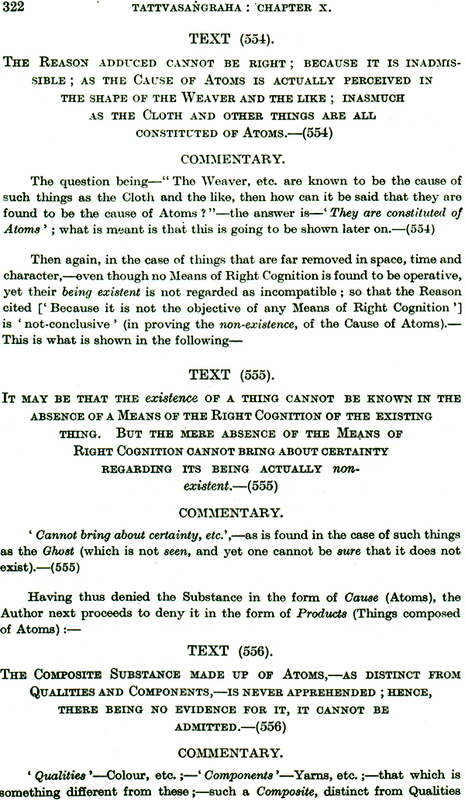 The reason provided is that such Cognition cannot be the most efficient instrument of the Apprehension, which has already been brought about by another Instrument, in the shape of the previous Cognition; hence the later Cognition cannot be regarded as which name can be applied only to what is the of the Pramd, Apprehension. I have often felt,-as Vijnanabhiksu also felt-that there was deep kinship between' Vedanta ' and' Buddhist Idealism' ,-the only difference of importance being that while the Buddhist Idealist regarded Janana, like everything else, to be momentary, though real-more real, at any rate, than the External World,-the Vedanta regarded Janana,-at least, the Highest Janana, 'Consciousness', which is the same as 'Soul', the highest Self, to be the only Reality-and permanent. We have been inclined to regard this as an achievement of the Great Shankaracharya, who succeeded thus in reconciling Hinduism and Buddhism and thus helping the fusion of the two.-It seems however that this feature of the 'Veda.nta", this stressing of the eternality of 'Janana', at any rate, was older than Shankaracharya,-if we admit the date usually assigned to this great writer. For Shankaraksita in Text No. 328 et seq., in dealing with the philosophers whom he calls declares (in Texts 330-331) that the defect in the philosophy of these is slight, consisting only in their regarding all Janana as 'one and eternal'. I So, if Shankaracharya came after the seventh century, he can be credited only with having emphasised this idea and thereby led to the fusion of the two Philosophies or Religions. This belief if further strengthened by a reference to the Brahmasiddhi of Mandana Mishra,-which is believed to be anterior to Shankaracharya. Under Text 348 we note another parallelism between the Buddhist and Vedanta ways of dealing with the 'Soul'. We know that, in the last resort, the Vedantin has recourse to the idea of the soul being one of the Inexplicable, things. We find the same idea expressed by Shantaraksita and his commentator under Text 348. The question having been put--" If no such thing as the Pudgala exists, then how was it that when asked if the Jiva was different from, or the same as, the Body, the Blessed Lord only vouchsafed the answer that 'this matter has not been explained '; why did not He say straight away that 'there was no such thing as the Jiva, Soul, apart from the Body ? "-The only answer given by Shantaraksita is that the intention of the Compassionate One was the denial of Nastikya (i.e the view that denies the other world and other Regions); and to this end he adopted various methods' -So that according to this also the Soul is something that has 'not been explained', is 'inexplicable'. On p. 16, line 7, we find mentioned a Kavya of the name of Sitaharana the poet's name is not given. Under Texts 2671-2673 we have a comparison drawn between the Mimamsaka's and the Buddhist's idea of Pralaya, Dissolution. According to the former, Dissolution consists in the destruction of particular countries and of particular families or peoples; and there is no such thing as Universal Dissolution; there is no evidence for any such Dissolution: while according to the Buddhist, there is an 'undeniable Destruction affecting even Brahma and others, which affects the Veda also; so that Dissolution consists in "the withdrawal of the energy of Fire, Water and Air, extending horizontally over the Trisahasra-Mahasahasra (1), downwards to the lowest limits of the atmospheric air, and upwards to the highest stages of Dhyana; which affects Brahma and other beings also". Text 2447 speaks of the Parasikas as perceiving nothing wrong in the marriage of their mother. Does this mean 'Widow-marriage'?--or something worse ?-Text 2807 speaks of these Parasikas as blindly adhering to their custom. In Text 2520 the view is expressed that' attraction by the Magnet is due to the contact of the invisible rays of light emanating from the Magnet and penetrating the piece of Iron'. Does this indicate the knowledge of the fact that all phenomena relating to Light,' Electricity and Magnetism are due to the action of the same' Force' or 'Fluid' ? The two important technical terms of Buddhist philosophy 'Pratisankhyanirodha' and' Apratisankhyanirodha' have been variously understood. The commonly-accepted view is that these terms stand for 'Conscious' and' Unconscious Destruction'. Texts 2748-2749 bring out the other explanation. They say-"The two Nirodhas are not regarded as being of the nature of Destruction ; because' Pratisankhya-nirodha is regarded as' Dissociation, one after the other, from Impurities-brought about by Wisdom'; while Apratisankhya-nirodha is that which serves as an absolute bar to the appearance of Impurities"; and this latter, adds the commentary, is due not to Wisdom, but to the inefficiency of the causes productive of the Impurities. Text 2945 speaks of Mimamsakas as "Prachya' (or Prochya); clops this stand for' Easterner'? And does that indicate that Mimamsa had its origin in the country to the East of Nalanda, where Shantaraksita is believed to have taught? This would fit in with common belief that it thousand years ago, the small land of Mithila was able to bring together nine-hundred Mimamsakas at any ordinary gathering of Pandita. The commentary on Text 3018 tells us of the juice of the' Drona flower as curing jaundice, when dropped into the eyes.